About "Decimal place value worksheets"
Decimal place value worksheets are much useful to the kids who would like to practice problems on decimals. 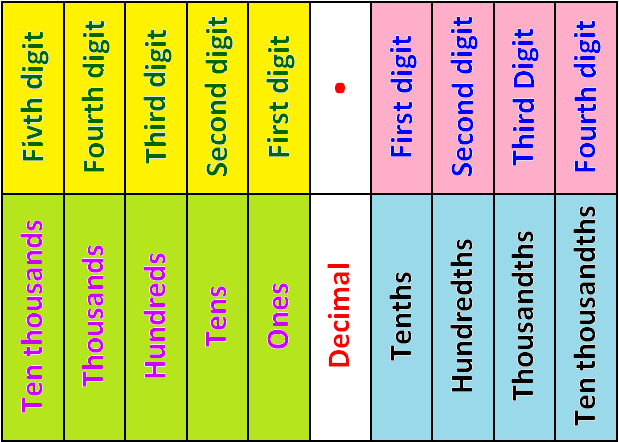 Before we look at the decimal place value worksheets, let us look at some basic stuff on decimal place value. To have better understanding of the above chart, let us look at an example. 1) In 0.5276, which digit is in the tenths place? 2) In 1.2347, which digit is in the hundredths place? 3) In 5678.92, which digit is in the hundreds place? 4) In 9856.9202, which digit is in the thousandths place? 5) In 207.159, in which place is the 9 ? 6) In 12.0598, in which place is the 5 ? 7) In 58702.19 in which place is the 7 ? 8) In 0.0048 in which place is the 4 ? 9) In 13256.02, which digit is in the ten thousands place? 10) In 7800202, which digit is in the thousands place? 11) Write the given verbal phrase as a decimal number. 12) Write the given verbal phrase as a decimal number. 13) Write the given verbal phrase as a decimal number. 14) Multiply 0.36 and 0.24 and round the answer to the nearest hundredths. 15) Divide 5 by 1.2 and round the answer to the nearest thousandths. In 0.5276, which digit is in the tenths place? Tenths place is nothing but the position of first digit after the decimal point. In 0.5276, the first digit after the decimal point is 5. Hence, the digit in the tenths place is 5. In 1.2347, which digit is in the hundredths place? Hundredths place is nothing but the position of second digit after the decimal point. In 1.2347, the second digit after the decimal point is 3. Hence, the digit in the hundredths place is 3. In 5678.92, which digit is in the hundreds place? Hundreds place is nothing but the position of second digit before the decimal point. In 5678.92, the second digit before the decimal point is 7. Hence, the digit in the hundreds place is 7. In 9856.9202, which digit is in the thousandths place? Thousandths place is nothing but the position of third digit after the decimal point. In 9856.9202, the third digit after the decimal point is 0. Hence, the digit in the thousandths place is 0. In 207.159, in which place is the 9 ? In 207.159, "9" is the third digit after the decimal point. According to the decimal place value chart, 9 is at thousandths place. Hence, 9 is at thousandths place. In 12.0598, in which place is the 5 ? In 12.0598, "5" is the second digit after the decimal point. According to the decimal place value chart, 5 is at hundredths place. Hence, 5 is at hundredths place. In 58702.19 in which place is the 7 ? In 58702.19, "7" is the third digit before the decimal point. According to the decimal place value chart, 7 is at hundreds place. Hence, 7 is at hundreds place. In 0.0048 in which place is the 4 ? In 0.0048, "4" is the third digit after the decimal point. According to the decimal place value chart, 4 is at thousandths place. Hence, 4 is at thousandths place. In 13256.02, which digit is in the ten thousands place? Ten thousands place is nothing but the position of fifth digit before the decimal point. In 13256.02, the fifth digit after the decimal point is 1. Let us look at the next problem on "Decimal place value worksheets"
In 7800202, which digit is in the thousands place? Here we don't have decimal point. So we can assume that the decimal point is at the end. That is 7800202 = 7800202 . Thousands place is nothing but the position of fourth digit before the decimal point. In 7800202, the fourth digit before the decimal point is 0. Write the given verbal phrase as a decimal number. From the given verbal phrase, we can have the numbers and their positions as given below. Multiply 0.36 and 0.24 and round the answer to the nearest hundredths. Whenever we want to round the number to the nearest hundredths, first we have to look at the digit at thousandths place. If it is greater than or equal to 5, we have to add 1 to the digit at hundredths place. Here, the digit at the thousandths place is 6 which is greater than 5. So we have to add 1 to the digit at the hundredths place. Divide 5 by 1.2 and round the answer to the nearest thousandths. Whenever we want to round the number to the nearest thousandths, first we have to look at the digit at ten thousandths place. If it is greater than or equal to 5, we have to add 1 to the digit at thousandths place. Here, the digit at the ten thousandths place is 6 which is greater than 5. So we have to add 1 to the digit at the thousandths place. We hope that students would have understood the stuff on "Decimal place value worksheets".